The sun is important for the body in many ways and encourages many enjoyable outdoor activities. barrier forming properties of Zinc Oxide along with Octinoxate for additional UV protection. Assimilated in a silky, lightweight cream containing aloe vera and sunflower oil, the Sunscreen Moisturizing Lotion SPF55 calms and nourishes the skin avoiding skin irritation and discomfort. Apply frequently. Re-apply if active, sweaty, or after swimming. Directions: Apply on sun exposed areas. Zinc Oxide , Octinoxate Sunscreen Moisturizing Lotion SPF55 is a powerful, water resistant sun defense formula providing broad spectrum protection from the sun’s harmful rays. With a blend of high performing sun defense actives and soothing extracts, the Sunscreen Moisturizing Lotion SPF55 is the perfect summer essential. The skin is continuously subjected to UV rays, harsh weather conditions, and pollution. Fortunately, the skin has natural regenerative capabilities that it uses to defend the skin from these elements. But, in order for the skin to properly regenerate, using sun protection products before and during exposure is highly important. Zinc Oxide is blended into the Sunscreen Moisturizing Lotion SPF55 formula due to its exceptional filtration and barrier system. Zinc Oxide supplies the skin with a physical barrier to filter out UV rays from penetrating the skin and causing cell damage. After long periods of sun exposure, the skin often becomes red, irritated, and dry. 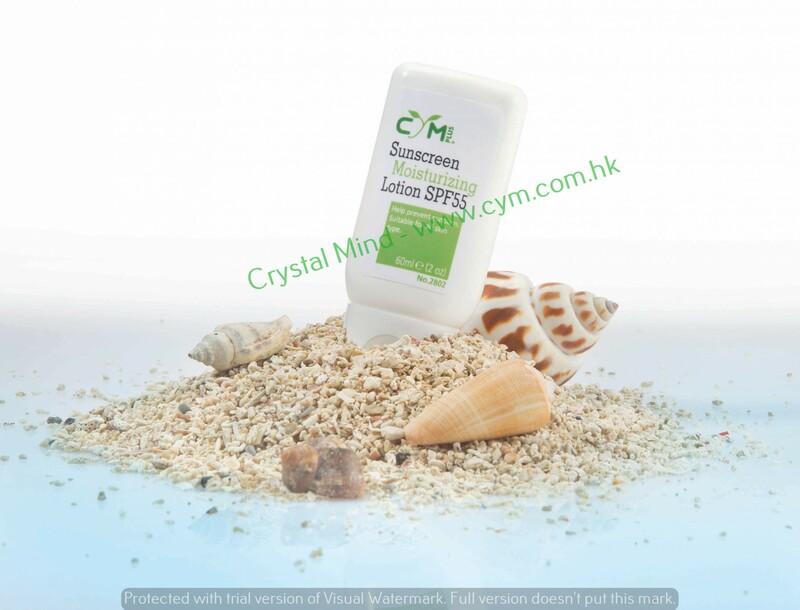 The Sunscreen Moisturizing Lotion SPF55 contains aloe vera extract and sunflower oil to address those very concerns. Aloe vera helps the skin to retain moisture while helping decrease any chance of irritation and inflammation. Sunflower oil is also infused into the formula for its Vitamin E potency and unrivaled skin nourishment complex. © CYM - Crystal Mind Development Ltd. All Rights Reserved.